In addition to validating feelings of anger and disappointment, this book is a fine vehicle for group discussion of ways to help others deal with these emotions. Sometimes just listening is best of all. 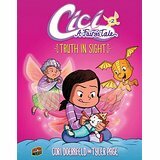 Fans of the earlier books will be excited about Cici's latest escapade. Fans of Ashley Spires's "Binky" books and Victoria Jamieson's new series "Pets on the Loose!" will be ready to tackle this next. A wonderful addition to a must-have series. A clever story that shows that with a little imagination it's easy to have fun.